Dodgers sign left-hander Jeremy Horst to minor-league contract. If the Dodgers end up extending a spring training invitation to another left-handed pitcher from their minor-league ranks (now that Robert Carson‘s invitation has been withdrawn), here’s a name to pay attention to: Jeremy Horst. The Dodgers signed Horst, 29, to a minor-league contract. Currently he does not have an invitation to the major-league camp. The Wyoming native has appeared in 72 major-league games over parts of three seasons with the Reds and Phillies from 2011-13. In 2014, Horst appeared in 45 games (three starts) for the Lehigh Valley IronPigs, the Phillies’ Triple-A affiliate, and posted a 4-2 record and a 3.98 earned-run average. 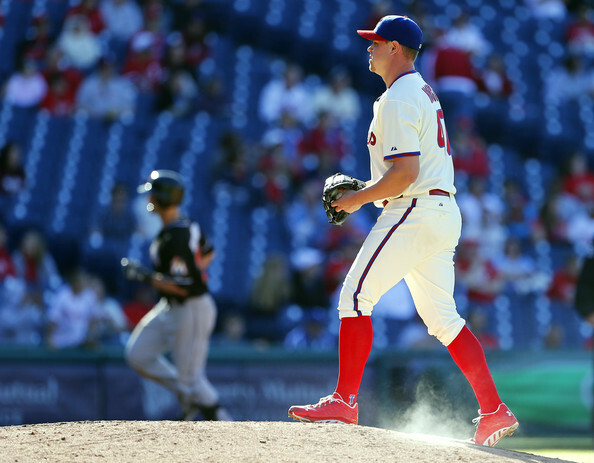 When the Phillies outrighted Horst for the second time, he elected free agency. With a fastball/slider combination and the ability to touch 94 mph on the gun, Horst was dominant against both left-handers (.170/.250/.191) and right-handers (.210/.319/.339) in 2012. The following year, he was limited to 31 games between the majors and Triple-A because of elbow soreness. Horst met with renowned elbow surgeon Dr. James Andrews and his ligaments were given a clean bill of health. A PRP injection ended his 2013 season early. Horst didn’t appear to fully recover until the final 11 games of last season, when he allowed just two runs in 19 ⅔ innings, walking six and striking out 22. He’s still a longshot to appear in a major-league game this season, but maybe not as much of a longshot as some of the other names in the Dodgers’ minor-league camp. Don’t be surprised if he gets a look in the Cactus League at some point. This entry was posted in JP on the Dodgers, On The Farm and tagged Jeremy Horst by J.P. Hoornstra. Bookmark the permalink.